The American Cancer Society states that eight of every ten non-melanoma types of skin cancers turn out to be basal cell carcinoma. The growth of this type of skin cancer is slow, it rarely spreads to other areas of he body, and it’s very unlikely that it would locate within the body to the lymph nodes. Regular cancer screening are of the utmost importance, especially as you grow older, because this allows for early detection. Early detection of any type of cancer allows treatment to immediately begin which prevents the possibility of the cancer being untreated. Cancers that are not known about or go left untreated are more likely to spread to other areas of the skin or internally. Basal cell carcinoma is the most common type of skin cancer that typically appears on areas of the skin experiencing the highest amount of exposure to sunlight, for example, the face, neck and the head are the parts of the body exposed to the sun more than any other. Natural sunlight isn’t the only cause of this type of skin cancer, artificial light from a tanning bed or tanning lamp also causes skin cancer. 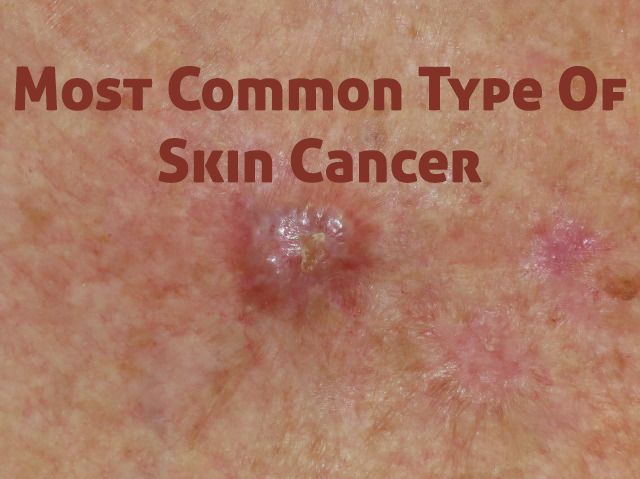 It’s also common for this type of skin cancer to come back again and would most likely appear in the same location as the previous time Individuals that have had basal cell carcinoma once are unfortunately at a higher risk of having to go through it a second time, either in the same location or elsewhere on the skin. Approximately, fifty percent of patients with this type of skin cancer will see new development within about five years from their previous diagnosis. There is still the mystery of skin cancer appearing in places that aren’t typically exposed to the sun. This fact tells us that it’s very likely that there’s other skin cancer risk factors, for example, the possibility of experiencing exposure to a toxic substance or having immune deficiency disorder making it very difficult to fight off illnesses. As you age common types of skin cancer can appear depending on the amount of time you’ve exposed your skin to sunlight without protection, dependent upon the type of cancer. It’s important to pay attention to your body and skin so that you’ll notice any differences or changes that occur that aren’t normal. Do research to stay educated and up to date on the most common types of skin cancer so you’ll know if you require a doctor for further evaluations. Basal cell carcinoma has the appearance of waxy bump and other forms as well This bump is usually a pearl white color located on the face, ears, head, or neck. These bumps are likely to bleed and develop a crust around them and they can grow to be quite large as time passes, especially if they are left untreated. This type of skin cancer is not only the most common but it’s also very simple to overlook it If you notice any of these signs make an appointment with your doctor as soon as possible to ensure early detection. The occurrence of basal cell carcinoma happens when an individual basal cell, located on the bottom layer of the epidermis, within the skin develops a mutation in the DNA itself. Basal cells are responsible for the creation of new cells and the loss of old cells which fall away as they are pushed to the surface of the skin. The DNA of the basal cell controls new cell growth therefore a mutation in this cell causes the basal cells to increase their quantity very quickly and they continue to grow larger rather than dying as they should. As these cells grow and multiply there isn’t space for them and a tumor most likely will form as a cause of the cell mutation. Here are the most important things to consider as you go through life. Prevention is the best key for any type of cancer because this helps you to have a better chance for avoiding skin cancer, early detection by knowing the signs to look for and paying attention to your body, and making good choices for yourself.